Need a bit more room? How about 7,000+ sq. 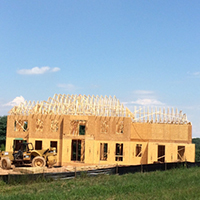 feet on a wooded, 5-acre site in Fairfax Co? 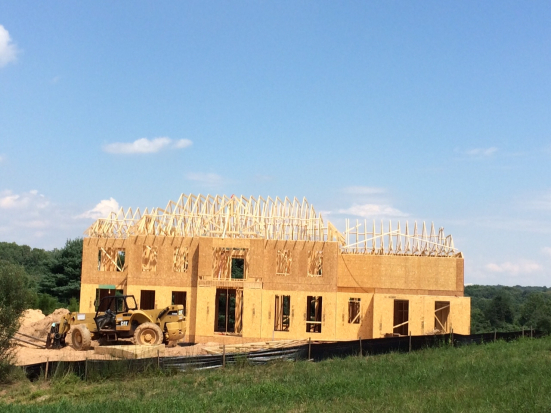 CLIFTON, VA — Construction is well underway on this elegant, three-car garage home (lot #3) at Clifton Point, and we’re projecting delivery by the end of the year – nice holiday present for the family? The Augusta is one of our most popular large models and this one is fully customized with upgraded finishes (of your choosing) , expanded living spaces, and exceptional detailing. If you look on our website, carrhomes.com, you’ll see this is our premier front elevation, #3. The main level will include a rear, walk-out morning room and extended family room. For added privacy there’s also a rear oak staircase from the kitchen to the upper level. Upstairs you’ll find four bedrooms, each with its own walk-in closet and four full baths. The elegant owner’s suite includes a luxurious spa bath and private sitting room, windowed on three sides. A fully-finished walk-out basement on the lower level features a rec room, den, media room, additional full bath and wet bar. Right now it is preview-priced at $1.3 million. For more information or a hard-hat visit, call Phil at 703-598-3095.